This article originally appeared as a Macworld Daily Reader iPad exclusive and is now available on Macworld.com for your enjoyment. While it’s easier to manage a single Mac, it’s still possible to have control over multiple Macs within your home. Not only can you remotely configure parental controls on another computer, you can also monitor what your kids do with their Macs, limit the hours they have Internet access, and share media between the computers within your home. You’re familiar with what you can do with a parental-controlled account. What you may not know is that once you’ve created such an account, you can change its options from another Mac. When you first launch the Parental Controls system preference on a Mac you’re managing you see a Manage Parental Controls From Another Computer option. Enable this option and proceed to configure the parental controls for that account. When you move to your Mac and launch Parental Controls, under the Other Computers heading within the Parental Controls window, you’ll spy the names of any Macs for which you’ve configured controlled accounts and enabled remote management. Click the Lock icon at the bottom of the window and enter your administrator’s password. Then select a computer whose controls you wish to configure. You’ll be prompted for an administrator’s name and password for that Mac (not for your own Mac). Enter each and click OK. All the controlled accounts on that remote Mac will appear. Select an account and you’ll find that you can adjust the account’s controls just as if you were sitting in front of that Mac. Additionally you can view that account’s log files. The advantages of this remote control should be obvious. First, it allows you to modify a Mac’s limitations even when a pouting minor has locked himself in his room. And you can do it very remotely. While on the road you could, for example, screen share to your Mac using Back To My Mac, open Parental Controls on your home computer, and then adjust another Mac’s controls. This needn’t be to “punish” your child. You may need to allow a particular application or website so your kid can get her homework done. Another operation you can perform remotely is approving the people your child communicates with. You can configure the People tab within Parental Controls so that whenever the user of the account attempts to send an email message or chat with someone not on the approved list, an email notification is sent to an account of your choosing. As long as you open that notification message with Apple’s Mail (it doesn’t work with other email clients) you can click an Always Allow button that then adds that address to the list of approved correspondents. If you and your child have separate Macs, you can watch his screen via OS X’s Screen Sharing feature. First, while sitting down in front of his Mac, log on to that Mac as an administrator and switch on Screen Sharing in the Sharing preference pane. In Allow Access For, select Only These Users, click on the plus-sign button, and choose Administrators. 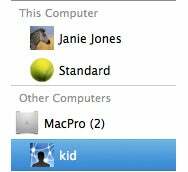 To observe, go back to your Mac, open a Finder window, locate the Shared entry in the sidebar, and look for the Mac your child is using. Select it and click the Share Screen button.You can now see what he’s doing on his Mac—and even control it. Your child can try to cut you off (by choosing Disconnect, and then your Mac’s IP address, from the Screen Sharing menu in the menu bar), but your Mac will immediately reconnect. Screen Sharing with a child can be a delicate matter. No one likes to be spied on, but it can help keep your kid on the up-and-up if he or she understands that you have the option, at any time, to see what they’re doing. Launch AirPort Utility, select your base station, and click the Manual Setup button. Select the AirPort tab at the top of the window and click the Access Control tab. 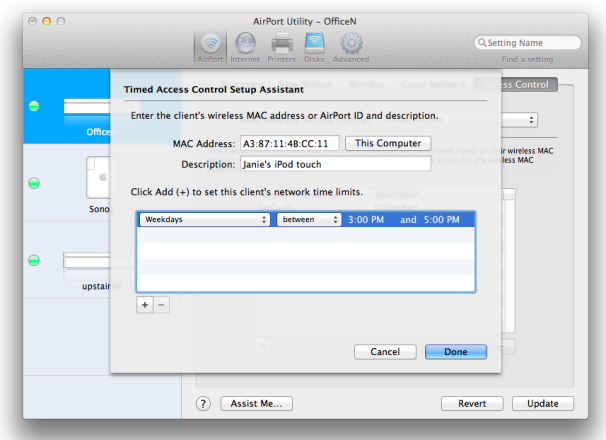 From the MAC Address Access Control pop-up menu choose Timed Access. This is where you begin setting up limits. Click the Plus button at the bottom of the pane, and in the sheet that appears enter the MAC address for the devices you want to limit (see “Blocking via MAC Address”). On an iOS device you’ll find this address by choosing Settings -> General -> About and locating the Wi-Fi Address Entry. On a Mac, hold down the Option key and select System Profiler (Snow Leopard) or System Information (Lion) from the Apple menu. When System Profiler appears, select Network and then in the Active Services column to the right, select the device used to connect to the Internet (AirPort or Ethernet). Search for the MAC Address entry in the results below. Blocking by MAC Address: With the aid of a wireless router such as an AirPort Extreme Base Station you can block devices’ Internet access. Once you’ve entered the MAC Address, type in a description (Curt’s iPhone, for example). Now configure the pop-up menus below. Here you can choose limits of No Access, Mondays, Tuesdays, Wednesdays, Thursdays, Fridays, Saturdays, Sundays, Weekdays, and Weekends. Click the Plus (+) button in this sheet and you can add more entries—you can, for example, include two entries for each weekday. Click Done and update the AirPort Extreme and the router will block access except during those hours allowed. Social networking sites such as Facebook are attractive for kids. It’s a place where they can establish an identity and hang out with their friends. But there’s the much-touted dark side: Kids often share too much, come in contact with strangers, and don’t know how to configure deliberately-opaque privacy settings. Parental Controls can help by allowing you to completely block Facebook and similar sites, but that’s a tough call with older kids. This is one situation where your best bet is parental involvement. If you’re going to let your kids have a Facebook account (Facebook’s rules require that users be 13 or older to have an account), learn how to configure its privacy settings so the least amount of information is shared (this includes blocking photos that your child appears in). Demand that your child "friends" you on Facebook so that you can keep an eye on their wall. And, without scaring them, let them know why they should be careful about sharing. You should also be very careful about providing a child with the means for spending money on the Internet. They should absolutely not have your credit card number or an iTunes ID tied to a credit card. If you want to allow your child to spend money on iTunes, set up an iTunes allowance within the iTunes Store or give them a gift card. Thanks to the file sharing capabilities built into OS X and Lion’s new AirDrop technology, it’s not difficult to move files between Macs on a local network. It is, however, trickier to create a single repository for music, video, and image files that can be shared between these same Macs. Apple’s solution is the sharing options found in iTunes and iPhoto. 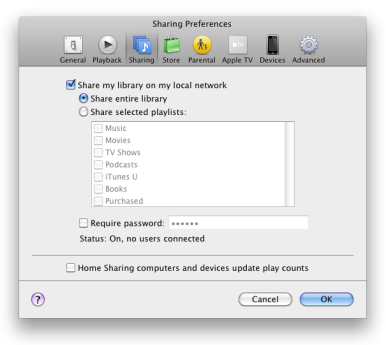 To switch sharing on in iTunes, open the application’s preferences, click on the Sharing tab, and enable the Share My Library On My Local Network option (see “Legal Music Sharing”). Do this and you can choose to share your entire music library or just selected playlists. To share your iTunes library with iOS devices, choose Turn On Home Sharing in iTunes’ Advanced menu. When you do you’ll be prompted for your Apple ID and password. Your iTunes library will now be playable from an iOS device that is connected to your local network. Legal Music Sharing: iTunes’ Sharing feature provides easy access to a house full of music. iPhoto has a similar sharing feature. From its preferences window, choose Sharing and enable both Look For Shared Photos and Share My Photos. Similar to iTunes, you can share all your photos or just select albums. Once you’ve switched on iPhoto sharing, others will be able to see your shared albums under iPhoto’s Shared heading on their Macs. Apple’s solution doesn’t solve the central repository problem, however, as each Mac has its own iPhoto and iTunes library—the family’s collection of media isn’t located in just one place. There are options for making it available, however. One option is to set up a Mac as a media server—a Mac mini, for example, or an older Mac you’re no longer using. When you want to add media to the family collection, you place it on this computer and then access that media via iTunes’ and iPhoto’s sharing areas. If a dedicated Mac is unavailable or too much for the family budget, you could obtain a Network Attached Storage (NAS) device. Many of today’s NAS devices include features for sharing an iTunes and iPhoto library. Simply attach the NAS to your network, copy your media to its drive, and access that media from iTunes and iPhoto much as you’d access any other shared media in these applications. You’ve heard it before and you’ll hear it again: It’s not a question of if your hard drive will die, but when. Each Mac in your home must be backed up if you care about your data. With Time Machine, individual Macs can be easily backed up to hard drives attached to those Macs. But that could mean purchasing multiple hard drives to outfit your herd of computers. The better solution is this instance is a network backup—a scheme where each Mac is backed up to a single device. Apple’s Time Capsule was built with exactly this in mind. Available in capacities of 2TB and 3TB (priced at $299 and $499 respectively), a Time Capsule is an easy-to-set-up solution, though not ideal if you have a lot of data to back up. Another, more flexible option is an old Mac configured as a backup server (perhaps the same one you’ll use to store and stream your iTunes content). With an old Mac you can not only add exactly as much storage as you need in the form of internal and external hard drives, but you can choose to use software other than Time Machine—a program such as Econ Technologies’ $40 ChronoSync, for example. When used in league with the $10 ChronoAgent on each Mac, backing up multiple computers to a single Mac is a relative snap. Online backup is another option. Though slow-going due to the time it takes to upload a lot of data, storing your most important files online offers the protection of an off-site backup. Although each user can upload files to a service such as Dropbox or a MobileMe iDisk (at least until June 2012, when MobileMe and iDisk cease to exist), dedicated services such as CrashPlan provide automatic in-the-background backup and can provide plans that allow you to upload an unlimited amount of data from up to 10 computers for as little a $6 a month, depending on the plan you commit to. At one time managing multiple accounts or, worse yet, multiple computers took the patience of a saint and the smarts and experience of an IT professional. That’s no longer the case. While it’s not yet the kind of thing you can do with your eyes closed, with some familiarity with the Mac OS and the hints you now have in hand, you too can control a home full of Macs.